The game was originated in Britain and is very similar to regular blackjack although there is a difference in the rules you have to familiarize yourself with before you play Pontoon. In some countries Pontoon is also known Spanish 21. It is definitely a great game, but it has its downsides - both cards of the dealer are dealt face down. It will be difficult to the player to make a wise decision since there is no clue of what the dealer is holding. Another drawback is that if you and the dealer have a tie, the dealer wins a hand. But in spite of these minuses the game has a lot of benefits. The 2-to-1 payout for a pontoon is a plus, as well as the 2-to-1 payout for a 5-card trick. The pontoon allows you to count an ace and 10 after splitting as a pontoon, and that is also advantageous to the pontoon player. All in all, it pretty much evens up. There are pontoon rules that will hurt you, while others will help you. Pontoon uses four to eight Spanish decks, each deck consisting of 48 cards — the regular 52 cards, less the four tens. Any card counter can tell you that removing any 10-point card from the cards favors the dealer. To make up for this, Pontoon gives to the player a host of bonuses and favorable rules. The following rules are consistent to Pontoon, across Australia. Pontoon is played with 8 standard decks and all card values are the same as in blackjack. 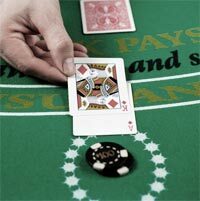 After placing a bet, each player receives 2 cards face up and the dealer gets 2 cards face down. First, the dealer checks his cards for a Pontoon (Blackjack), and if he has one, all bets are lost. Dealer wins all ties inclusive of Pontoons and 5-card hands. Players can Hit at any point, even after doubling down. A player’s 21 or blackjack wins immediately. Players may split up to 2 times for a maximum of 3 hands. You can split only if you have cards of equal rank, including aces. When you split aces, a Pontoon pays out 2:1, and doubling and splitting are allowed. The dealer must draw to all point totals of 17 or more, except must hit all soft 17’s. All dealer’s non-busted 5-card hands have the same value as a player 5-card hand. Player may double on 9 to 11 only. A five-card 21 pays 3 to 2, a six-card 21 pays 2 to 1, a seven-or-more-card-21 pays 3 to 1. The bonuses are not paid if the player doubled. A 6-7-8 or 7-7-7 of mixed suits pays 3 to 2, of the same suit pays 2 to 1, of spades pays 3 to 1. These bonuses are not paid after doubling. The chart below gives the optimal Pontoon strategy for all possible situations. First, you should find your hand’s point total on the left hand side and then compare that to the number of cards in your hand to find the correct play. 11 D4 D5 D5 D5 D5 D4 D4 D4 ? ? Like any form of Blackjack, the best strategy is to practice Pontoon as much as possible. The more time and effort you spend on Pontoon, the quicker you will pick it up and the easier it will be for you to try new strategies.